This week we've focused on some cool scientific discoveries, which is, honestly, my happy place. So we'll round out the week with a new piece of research that is kind of a double-edged sword. It is (1) fascinating, but (2) tells us about how the Earth is going to be destroyed. So while it's interesting, cheerful it isn't. Of course, the upside is that the Earth isn't going to be destroyed for another few billion years. So even in the best-case scenario, I won't be around when it happens. The research was led by Christopher Manser of the University of Warwick, and is based on observations done of a white dwarf star at the 10.4-meter Gran Telescopio Canarias on La Palma in the Canary Islands. White dwarfs are the remnants of stellar cores for stars smaller than about 10 times the mass of the Sun. At the end of their lives, stars in this range exhaust the hydrogen fuel in their cores, and switch to burning helium -- this gives an added kick to the core temperature, and the outer atmosphere balloons out into what's called a red giant. But eventually, it becomes a nova -- it exhausts the helium as well, the core collapses and heats up (dramatically), and that blows the outer atmosphere away (forming what's called a planetary nebula), in an expanding cloud of gas and dust surrounding the exposed core -- the white dwarf star. 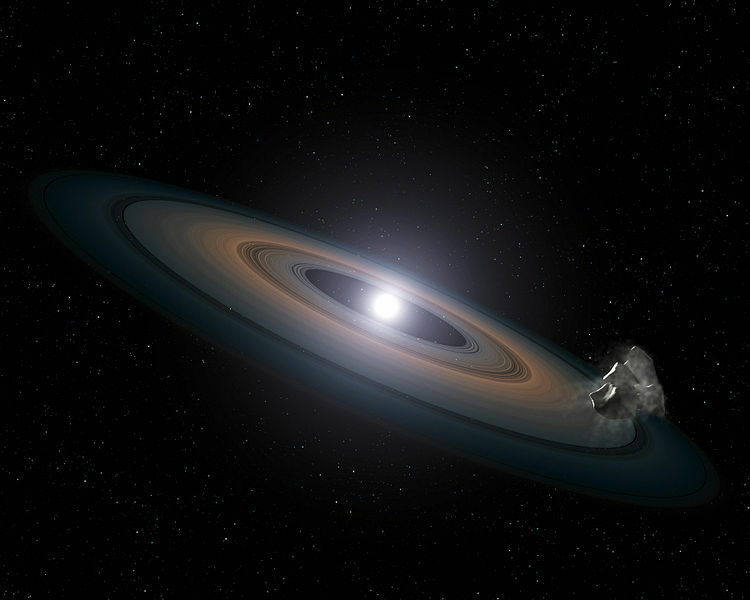 It was long thought that a star that becomes a white dwarf will in the process completely destroy any planets that happen to be orbiting around it. When the Sun becomes a red giant, for example, it's believed that its outer edges will be somewhere between the orbits of Mars and Jupiter. So where you are sitting right now will be inside the Sun. I like it warm, but that's a bit toasty even my my standards. So it was quite a shock when Manser et al. found that the white dwarf they were studying, the euphoniously named SDSS J122859.93+104032.9, had a planet orbiting it. The fact that they could even tell that is pretty extraordinary. As I explained in a previous post, the two most common ways of detecting planets are by occlusion (the star dimming because the planet has passed in front of it) or by Doppler spectroscopy (seeing shifts in the frequency of light from the star because it's being pulled around by the planet as it orbits). Both of these work better when the planet is massive -- so for a little planet around a littler star, it's kind of amazing they even figured out it was there. What they found was that there was light coming from the star system that was consistent with the emission spectrum of calcium, but oddly, the calcium spectral lines were split in two -- and the two lines oscillated back and forth with a period of almost exactly two hours. The best explanation, say Manser et al, is that there is a planetesimal -- probably the iron-rich core of a planet that once orbited the star prior to its demise -- that is dragging around a cloud of calcium-rich gas that is being Doppler shifted first one way and then the other every time the planet circles the star. The method of Manser et al. has revealed the presence of planetesimals without the need for the particular orbital geometry that is required by the transit method. It could therefore be used to identify the presence of planetesimals orbiting other polluted white dwarfs and advance the study of the planetary systems evolution. Furthermore, because planetesimals orbiting white dwarfs are believed to be the remnant cores of shattered planets, studying the spectra of polluted white dwarfs known to be surrounded by planetesimals enables one to gain information about the chemical composition and metal abundances of the infalling material—that is, planetary cores. The most awe-inspiring part of this research is that this will be the likely fate of the Earth -- assuming that the red giant and nova phases of the Sun don't destroy it completely. All that will be left is the remnant core of the Sun and the remnant core of the Earth, circling each other and gradually cooling, becoming a whirling pair of cinders forever spinning in the infinite dark, cold vacuum of space.